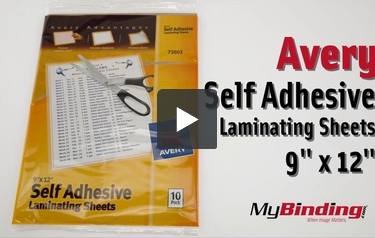 For quick laminating needs, these easy-to-use Avery Laminating Sheets are the ideal tool. Each sheet is coated with self-adhesive for convenient, inexpensive lamination. Simply use the included grid to size the document, place the document on the adhesive side of one sheet, lay the second sheet adhesive side down to seal the other side of the document and trim the edges. Soon, with the help of Avery, you'll have a beautifully laminated document that looks professional and will stand the test of time. Avery Self-Laminating sheets are very stress-free to use. All you need is a pair of scissors and a laminating sheet to start laminating everything in the office. The gridlines on the backing help you straight cut to the size you need. In the office protect your quick reference sheets. At home they work perfect to protect labels on containers in the pantry. I've even been known to get out the scissors and a laminating sheet when tape won't do for a craft project. The order arrived really fast. I laminated birth certificates, marriage license, and other important papers to keep them from fading. No bubbles either. You won't go wrong with these! If you gotta laminate small things and don't want to pay somebody else to do it (plus they have to see what to laminate and maybe you don't exactly want them to even peek at it! ), then this is the thing to buy. Avery Laminating Sheets Clear 9" x 12"
Transcript: Welcome to MyBinding.com. These are the Self Adhesive Laminating Sheets in 9x12” from Avery. Welcome to MyBinding.com. These are the Self Adhesive Laminating Sheets in 9x12” from Avery. If you need some laminated documents, but don’t have a laminating machine, these laminating sheets do the trick. You can use the grid printed on the adhesive cover to precut the sheets to the necessary size. Simply peel off the adhesive cover and lay your document down on top, then repeat for the second cover and seal it all together. Clean up the edges with scissors or a straight edge. With the help of Avery you’ll have perfectly laminated documents that will stand up against any machine laminated docs.